Enjoy Mouraria Apartments Enjoy Mouraria Apartments is located in Lisbon’s historical area, just 400 metres from Martim Moniz Square and its Metro station. 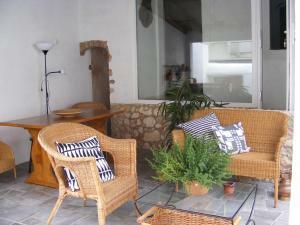 The cosy apartment has a living area with a sofa, flat-screen cable TV and a DVD player. A wide range of restaurants, cafés and bars is available within a 10-minute walk. Blue House - As Portuguesas Blue House - As Portuguesas offers pet-friendly accommodation in Lisbon, 400 metres from Chiado and 400 metres from Bairro Alto. There is a private bathroom with a bath or shower and bidet. 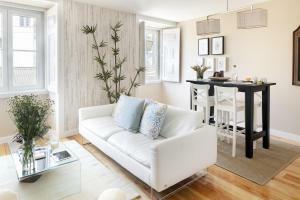 Apartment Nas Amoreiras Apartment Nas Amoreiras offers pet-friendly accommodation in Lisbon. Liberty Avenue is 1 km from Apartment Nas Amoreiras, while Bairro Alto is 1 The nearest airport is Portela Airport, 6 km from the property.. 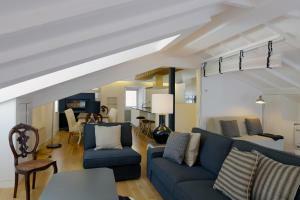 Feels Like Home - Luxus Santa Catarina The elegant Feels Like Home - Luxus Santa Catarina is located in Lisbon. The unit features a living area with comfortable sofas and a fully-equipped kitchen with a counter, stools and a dining table. 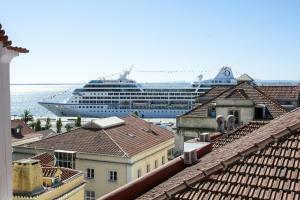 Historical Chiado is within 800 metres and features various historical cafés and traditional shops..
Castle 122 Apartment Located in the historical centre of Lisbon, Castle 122 is just a few minutes’ walk from the Alfama neighbourhood and 300 metres from the iconic São Jorge Castle. There is a fully equipped kitchenette ad the private bathroom has a bath. Casa da Memoria Casa da Memoria is located in Lisbon, just 500 metres from the Belém Garden and 800 metres from the Tagus River. This 2-bedroom house comes with a private bathroom and a sofa bed in the living area. Alternatively, local restaurants are available within a 5-minute walk. 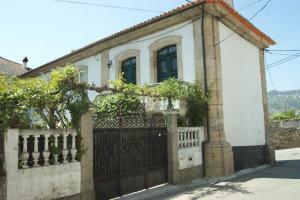 Traditional Family House In Alfama price per day from € 70 2 km from Rossio, Traditional Family House In Alfama offers accommodation in Lisbon a 5-minute walk from Santa Apolónia Train Station. Composed of a regular-sized room and a smaller bedroom, it has 1 bathroom with bath and bidet, this holiday home is equipped with a TV. Marquês Soul price per day from € 60 This charming guest house is located in the city centre, just 200 metres from posh Liberdade Avenue. Featuring themed rooms, the Marques Soul features some units with a seating area. 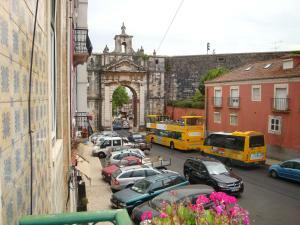 Several traditional Portuguese restaurants and international eateries are nearby. Casa de Sao Mamede Hotel price per day from € 70 The Casa de São Mamede is a small hotel sited in a renovated 17th century building. The hotel's charming and comfortable rooms include a satellite TV, private bathroom with free toiletries, air conditioning, free WiFi, desk and a wardrobe. Residencial Londrina price per day from € 70 Located in the heart of Lisbon, Londrina B&B Lisbon offers air-conditioned rooms with Portuguese-tile headboards and antique furniture. This unit includes free Wi-Fi, elevator and 24-hour front desk staff. The lounge is decorated with old-style couches and lampshades. My Home in Lisbon price per day from € 21 So Far So Homey enjoys a privileged location in the Lisbon centre. All units come with a safety deposit box and include access to shared bathroom facilities. The nearby central area has various restaurants available, many within a 5-minute walk..
Morpheus guest house price per day from € 30 Morpheus' Kingdoms guest house boasts a central Lisbon location near Avenida da Liberdade, a 4-minute walk from Marquis of Pombal Square and metro station. All of the rooms have high ceilings and large windows with street views. There is elevator access, luggage storage and a laundry service available on site..
1. Head east on Av. José Elias Garcia toward Rua Dr. Manuel de Arriaga. 2. Slight right onto Rua Dom Pedro Iv. 3. Continue onto Estrada Velha de Queluz. Go through 1 roundabout. 4. Continue onto Rua Gonçalves Ramos. 5. Turn right onto Av. Conde Castro Guimarães. 6. Continue onto Estrada Cabos d'Ávila. 8. Take the exit onto A5 toward Lisboa/A2 Sul. 9. Continue onto Viaduto Duarte Pacheco. 10. Continue onto Av. Engenheiro Duarte Pacheco. Golf club Aroeira 1, 15.6 km from the centre of town of Lisbon. 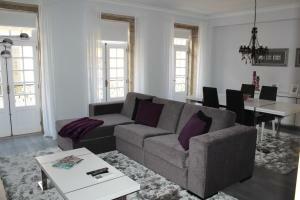 Golf club Aroeira 2, 15.8 km from the centre of town of Lisbon. Golf club Belas, 16.4 km from the centre of town of Lisbon. Golf club Quinta do Peru, 20.5 km from the centre of town of Lisbon. Golf club Penha Longa (Atlantico), 23.5 km from the centre of town of Lisbon. Golf club Quinta da Marinha, 28.1 km from the centre of town of Lisbon. Golf club Oitavos Dunes, 28.8 km from the centre of town of Lisbon.